county, namely: Mrs. Cora Hethley, Mrs. Grace Coulter, Mrs. Lizzie Shoup, Ed, Joseph, Ernest, William and George. Mr. and Mrs. Barrett made their first home in Iowa and in March, 1887, brought their one child, a son, with them to Custer county and secured a homestead of one hundred and sixty acres of land in section three, township sixteen, range twenty-two, which was their home for a number of years. For several years Mr. Barrett served as a member of the school board of district number one hundred and forty-eight, and he has always been ready to forward any worthy cause in the community. Mr. Barrett and wife have had four children, as follows: Charles, is married and lives in Dunning, Nebraska; Orlonzo died June 28, 1888; Bertha E. lives at home, and Eugene died March 11, 1901. The family are well regarded and have a wide circle of friends and acquaintances. Leopold Ege, one of the old settlers of this region, where he chose his home in the early days, occupies a good home and valuable property in section twenty-three, township thirty-one, range four, Knox county, Nebraska, where he is well known and respected by all with whom he has to do. He has done his share in the upbuilding of his locality, and is well and favorably known throughout this part of the state. Mr. Ege is a native of Germany, in which country he was born in 1842, where he spent the earlier portion of his life. In 1881, when he was thirty-nine years of age. Mr. Ege left his native land, with his wife and five children, and came to America, the land of plenty and golden opportunities. He set sail from Havre, France, to where he and his family had journeyed overland by rail, on the steamship "Labrador," and landed in New York from where they immediately started for the west, going as far as Sioux county, Iowa, where they remained over four years. He then came to Knox county, Nebraska, in 1886, where he took up a homestead in the location where he is now living. In the first days of his settlement in Knox county, Mr. Ege experienced many hardships and discouragements. In the memorable blizzard of 1888, he lost all the stock he possessed except one cow, and suffered many other losses and struggles. Mr. Ege was united in holy matrimony in 1870 to Miss Rachel Pefferly, and Mr. and Mrs. Ege are the parents of ten children, whose names are as follows: Lizzie and Rachel, both of whom are deceased, the former dying in Sheldon, Iowa, and the latter in Knox county; Caroline, died in Germany; Charles, who lives in Canada; Chris, of Montana; John of Washta, Iowa; Annie, wife of Thomas Vourn, of Knox county; Bertha, wife of Theodore Schaefer, of Knox county; Alice, of Wasjta, Iowa, and Carrie, who lives at home. In addition to their own children, Mr. and Mrs. Ege have taken a boy, Charles Woods, to raise, he having been with them since he was four months old. Mr. and Mrs. Ege and family are highly esteemed and respected in their community, and reside in their pleasant home where they are surrounded by a host of good friends and acquaintances. Robert Ruhlow, a retired agriculturist of prominence in Pierce county, Nebraska, is one of those substantial citizens whose integrity and industry, thrift and economy have added so much to the material wealth and growth of Nebraska. Agriculture forms the basis of wealth in that part of the country, as indeed in most sections of the United States. It is therefore of great importance that the class of people who inhabit the great farming regions of the country should represent those elements of sterling worth go prominently displayed by the majority of the early settlers and their descendants. Mr. Ruhlow was born March 4, 1864, near Watertown, Wisconsin. His father William Ruhlow, was born in the province of Pomerania, Germany, in 1830, where after growing to manhood he followed the occupation of wagon maker. He emigrated to America in 1849, sailing from Hamburg to Havre, France, on a small sailboat, and there embarked in a sailing vessel and landed in New York after a voyage of six weeks. After landing, the family came west to Wisconsin, where the father took up forty acres of timber land. In 1867, Mr. Ruhlow, with his family, migrated to Madison county, Nebraska, coming by ox team with a party of Wisconsin people bound for the far west. He took up a homestead claim in Madison county, living for a time in a dugout, and later built a log house, for which they hauled the logs from the Elkhorn river. The family went to farming their land and managed to get along very comfortably, hauling their supplies from Columbus, Omaha and Sioux City. At this time this portion of the country was almost a wilderness, and deer, elk, and antelope were plentiful. There were but few, settlers here, and Indians were camped all over the country. The pioneers experienced many hard times and frights from the red skins, but never had any great trouble through them. The grasshoppers destroyed all their crops in 1873, 1875 and 1879, and in the blizzards of 1869, 1870, 1873, 1880 and 1888 caused them much suffering. Robert Ruhlo was out in the blizzard of October 1880, attempting to save their stock. In 1886 Mr. Ruhlow, with his father, took a tree claim in Pierce county, Nebraska, in section thirty township twenty-six, range three, which is now a well improved farm and the residence of our subject until February, 1911, when he retired from farming and became a resident of Pierce. Barfknecht, and they have nine children: Mabel, who died when a small child; Albert, Alvina, wife of Anton Bokemper, has one child; and Julius, Nettie, Liddia, Edna, Walter, and Ruth. Mr. Ruhlow bought his father's interest in the land he lived on for so many years, and owns three hundred and twenty acres, twenty acres of it covered with a grove of large trees, their own planting. Mr. Ruhlow worships at the German Lutheran church, and is a member of the Woodmen lodge. He is a democrat and served as school treasurer. To the men of perseverance and strong determination who went to Nebraska when it was yet undeveloped as an agricultural and commercial region, the present prosperity enjoyed there is due. Such a one is Mr. John Chindvall, who resides in section four, township thirty, range two, Knox county, where he owns a good farm of two hundred and forty acres, which is well improved. Mr. Chindvall is a native of Sweden, his birth occurring in the province of Osterjotland, October 3, 1870. He is a son of August and Hattie (Lotman) Chindvall, both natives of Sweden. He grew to the age of twelve years in his native land, where he received his early education, and in 1882 came to America with his parents, embarking on a steamship, sailing from Guttenberg and landing in New York City. After landing in the United States, our subject and his parents traveled westward locating in Burt county, Nebraska, where the family lived seven years, and where our subject grew to his maturity. In 1890, Mr. Chindvall came to Knox county, Nebraska, where his father had previously purchased two hundred and forty acres of fine land, which John lived on until purchasing his present home. Mr. Chindvall's parents followed him to Knox county in 1892 and occupied the old farm until the father's death, and two years later the mother moved to Wausa where she now resides. In 1902 John Chindvall purchased his present farm of two hundred and forty acres and has since resided on, and operated, it. He has made many improvements - among others having been the building of a large house - one large barn, granary, log house, corn crib, etc. He has all but forty acres under cultivation, the forty being used for pasture. He raises considerable cattle and hogs. In politics he is a republican, and is a member of the Swedish Lutheran church at Wausa. Mr. Chindvall is one of those sturdy sons of Sweden wbo have proven their sterling worth in the upbuilding and making of Nebraska state, and he well deserves the credit which the citizens of his locality have accorded him. He is a man of many good qualities, and is honest and upright in all his dealings with mankind. John Hafner, proprietor of one of the most valuable estates in Knox county, Nebraska, has been a resident of that locality for a number of years. He is prominently known throughout the northeastern part of the state as one of the foremost farmers and stockmen in Nebraska, and after many years hard labor in building up his business, is now prepared to enjoy life in peace and comfort, surrounded by a host of good friends and acquaintances. He resides on section twenty-one, township thirty, range three, where he attends to his farm and business. Mr. Hafner is a native of Germany, his birth occurring in 1861; he is the son of John and Mary (Lana) Hafner, and is the third in a family of four children. His father served in the German army in the war between Denmark and Germany in 1848. Mr. Hafner grew to his manhood days in his native land, and in 1881, with his parents, came to America, and after landing in New York City, where they remained a week, they proceeded westward, locating in Omaha, where they lived five years. In 1886, Mr. Hafner came to Knox-county, Nebraska, buying one hundred and sixty acres of fine land from his brother Henry, a sketch of whom appears on another page of this review., Mr. Hafner has been. thrifty and industrious during his residence here, and has steadily increased his property until now he owns two hundred and sixty-six acres of good land, five acres of which are set to trees. He formerly owned four hundred acres, but recently traded one hundred and sixty acres for city property in Bloomfield. Mr. Hafner was united in marriage in 1900 to Miss Minnie Menkens, and Mr. and Mrs. Hafner are the parents of two fine children, whose names are Christ and Edward. Mrs. Hafner is also a native of Germany, from which country she came to America some twenty-nine years ago. Mr. and Mrs. Hafner and family reside in their pleasant home in the location above named, where they are highly esteemed and enjoy the respect and friendship of a host of friends and acquaintances. Among the prosperious and enterprising farmers of Madison county, Nebraska, none is better known or more highly respected than the subject of this review, who resides on section twenty-six, township twenty-three, range two. Mr. Barnes has devoted many years of his life to the pursuit of agriculture in this region, and has been a potent factor in producing the present prosperity enjoyed in his locality. tion and grew to Manhood in his native land, and after attaining his majority worked out in Manchester, England, working at whatever he found to do. In 1879 Mr. Barnes, with his family, came to America, of which country and of the cheap lands to be had, he had heard so much. The family embarked on a steamer at Liverpool, and were ten days on the water. After arriving in the United States, they went to Ford county, Illinois, where they remained three years. In 1882 Mr. Barnes and family came to Madison county, Nebraska, where he took up a homestead in section twenty-six, township twenty-three, range two, which remains the homestead farm. Their first dwelling was a sod house in which the family lived comfortably for eight years. During those first years of residence on the western frontier, the Barneses, as well as the few other families who came here at an early period, suffered many hardships and discouragements. Mr. Barnes lost part of his stock in the terrible blizzard of January 12, 1888. This storm will ever remain vivid in the memory of Mrs. Barnes, whose husband was working away from home at the time to get money with which to support his family. She was left alone with several small children, and the storm was so severe she could not get out to get fuel for the stove; she chopped up the chairs and table to make fuel to keep the children and herself from freezing to death. Prairie fires were another source of danger and had to be fought many times to save life and property. As late as 1894 our subject lost all that season's crops through the hot winds that prevailed on account of the terrible drouth of that year. Mr. Barnes was united in marriage March 25, 1875, to Miss Mary Womsley, who is also a native of England, and a daughter of David and Sarah Womsley. Mr. and Mrs. Barnes are the parents of eight children, four of whom are living: James, Samuel, Elizabeth Emma, Wilbert, and Mary Alice; Sarah, Jane, Womsley, Adda, and Harry are deceased. They are a fine family and enjoy the respect and esteem of all who know them and have a host of good friends and acquaintances. Mr. Barnes is a member of the Episcopal church, and is a republican. Joseph B. Smith is one of the best known men of Custer county, where he was one of the early settlers. He was born and reared on his father's farm in Washington county, Pennsylvania, the date of his birth being April 6, 1848, and he is next to the youngest child of Dennis and Sophia (Carwin) Smith, also natives of that state. The parents are deceased, and there are three sons and one daughter now surviving, all of whom except Joseph live in their native county. The Smith family has been in America for several generations back, the great-great grandfather of Joseph Smith having been with Washington at Valley Forge during the Revolutionary war. The grandfather served in the Black Hawk war. A brother of Joseph, James Smith, served in the civil war as a member of the eighty-fifth Pennsylvania Volunteer Infantry, enlisting in 1861. A nephew of Joseph B., Alonzo Smith, served in the Spanish-American war, being sent to the Philippine Islands. An uncle, Peter Smith, served during the civil war as a member of the Twenty-second Pennsylvania Cavalry, and four cousins also served in that war. It will thus be seen that Mr. Smith is of good old American stock and descended from a family of patriots. March 9, 1864, Joseph B. Smith enlisted in Company A, Sixth Pennsylvania Cavalry, being mustered out at Louisville, Kentucky, in August, 1865. He received an honorable discharge at Harrisburg, Pennsylvania, August 18, 1865, having served under General Sheridan and participated in numerous skirmishes and engagements. At the close of the war he returned to his home and went back on his father's farm. In March, 1877, he came to Fillmore county, Nebraska, making the trip by rail, and in the spring of 1883 he came to Custer county and took up a homestead comprising the northwest quarter of section twenty-seven, township eighteen, range twenty-one. He returned to Fillmore county, put in a crop there, and in the fall came to his newly acquired land. Mr. Smith was married in Greene county, Pennsylvania, June 9, 1869, to Emma Bristor, and at the time of coming to Nebraska brought his wire and one child. They lived on their farm they had first acquired in Custer county until 1895 and in March of that year removed to a farm two and one-half miles east of Merna. They now reside in Merna, where he is engaged in grocery business. He engaged in business about 1901, conducting a livery stable and running a mail route until 1909, when he started his present business. He has built up a good trade and has the confidence and esteem of his customers and associates and is recognized as an upright, enterprising business man. He is one of the earliest residents of the county and has been identified with its development and progress, having passed through the years of privation and hardship during the early years. His sister Priscilla accompanied him when he came to Fillmore county. He now has a very pleasant home in Merna, and is a Royal Highlander and is Commander of Samuel Rice post Grand Army of the Republic. He has seen central Nebraska grow from its wild state to a region of prosperity and progress. Mrs. Smith, who was all estimable woman of high character and noble purpose, and had many sincere friends, passed away at her home in Merna, May 10, 1910. The only daughter, Maggie, is the wife of W. M. Dodge and they reside east of Merna. There are five children in the Dodge family. A sketch of Mr. Dodge appears in this work. 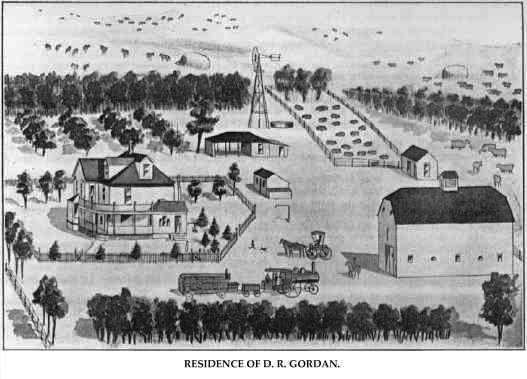 Among the very early settlers of Nebraska: were the members of the Gordan family, David B. Gordan having lived in the state since he was two years of age. He is one of the self-made men of his part of the state, and now owns a well developed farm in Custer county, west of Arcadia. He is recognized its one of the substantial men of his locality and has earned his possessions by his own efforts. Mr. Gordan was born in Fulton county, Illinois, April 10, 1867, fifth in a family of seven children born to John and Mary (Bivins) Gordan. The father a native of Germany came to America in childhood growing to manhood in the state of Pennsylvania, where he was married. He enlisted in a Pennsylvania regiment, serving two years in the civil war. In 1870 he came to Milford, Nebraska, and died in York county, that state, in 1891. The mother a native of Illinois and of Scotch and German parentage, died in Custer county, Nebraska, in 1904. Of their children besides David B. the following may be related: Mrs. Susan Casteel and Mrs. Lily Dascher live in Custer county; Mrs. Hattie Hulshizer lives in Brown county, Nebraska; Mrs. Ida Francis lives in Grant county, same state; one son is deceased; Lorenzo D. lives at Schuyler, Nebraska. When he was two years old Mr. Gordan accompanied the rest of the family to Milford and two years later they removed to Seward county, where the father secured a homestead and lived on it nineteen years. Later he moved to Gresham, York county. David B. Gordan has always followed farming and in 1898 purchased two hundred acres of land on section twenty-three, township seventeen, range seventeen, Custer county; which is still the home place. He has four hundred acres in sections fourteen and fifteen devoted to grain and cattle. He has devoted this place largely to stock raising, in which he has met with gratifying success, and in the year 1909 he erected a handsome residence at a cost of five thousand dollars. We give in excellent view of this model country home on another page of this work, to which we invite attention as one of the best in this section of Nebraska. A complete system of water supply and gas illumination is installed in both house and barn. September 2, 1889, Mr. Gordan was married in Custer county, to Anna Abresch who was born in Milwaukee, Wisconsin, daughter of William and Anna Abresch. Her father, a native of Germany, served in the German army and later came to America, locating in Milwaukee, where his death occurred in 1879. His wife is now living in Seward county, Nebraska and she has one son, Charles, also living there. Mr. Gordan has always had much patriotic love for Nebraska, the only home he can remember, and has taken an active interest in public affairs. He is serving his ninth year as moderator of school district number eleven and has promoted the cause of education and every other good cause which he considers for the best interests of the people. In politics he is republican. Eight children have blessed the union of Mr. Gordan and wife, namely: Louis W., Clifford H., married Kate Echer of Schuyler; Esther, married Victor Malm, Lloyd, Theodore, Myrtle, Charles, and Alven. Mr. Gordan passed through many trying experiences in his early years in the state and since he began farming on his own account has met with various reverses and discouragements In the year 1892 he lost all his crops by hail and during the next four years his crops were a failure by reason of drouth, or hail which destroyed or injured five successive crops. Four years the grasshoppers totally or partially devoured his grain and growing corn, one year being numerous enough to stop the trains by making slippery tracks where ground beneath the wheels. When the family came to the state, antelope were to be seen by the thousands; Mr. Gordan, senior, killed many of them, as well as deer and buffalo to supply the family in meat. He, together with an elder son and son-in-law had just returned from hunting west of Grand Island when the three days' blizzard of April 12 to 14, 1873, broke over the country. Mr. Gordan of this sketch just missed being out in the well-known blizzard of January 12, 1888. He used a clothesline to find his way to the barn and return in feeding his stock. For thirty-five years, since the age of ten, Mr. Gordan followed threshing; in that time he owned several horsepowers, ten new engines, fourteen separators, and seventeen corn shellers. His policy was to sell while still in good condition and buy new, thus avoiding breakage and expensive repairs. In 1911 he retired from the business having spent enough years in the trying vocation. Residence of D. R. Gordon. 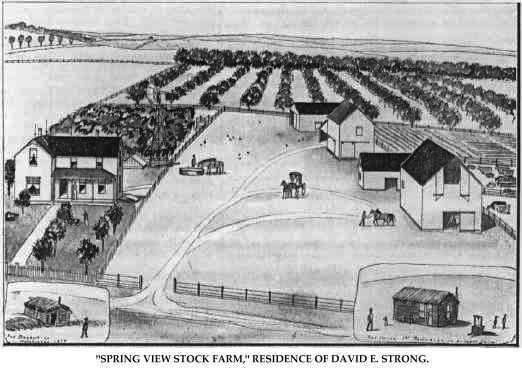 David E. Strong occupies a foremost place among the energetic and prosperous farmers and ranchmen of Valley county, Nebraska, where he owns a good farm in section twenty-two, township nineteen, range thirteen.. He has developed this farm by energetic labors, supplemented by honest dealings, and is one of the highly esteemed men of his community. Mr. Strong has passed through all the early Nebraska times, and is widely known throughout the eastern part of the state as having done much toward the upbuilding of the agricultural and commercial interests of the region. July in 1884, in Illinois; three sons and one daughter are living: David E., lives in Valley county: Joseph in Hamilton county; Frank went to southern Illinois and nothing has been heard from him since; Charles lives in Rockford, Illinois; and Martha, who married Seger Rouse, resides in Rockford, Illinois. David E. went out for himself at an early age, coming to Hamilton county, Nebraska, in 1878, and to Valley county in 1879. As soon as he became of age he took up a homestead in Valley county, on section two, township nineteen, range thirteen, and also timber-claimed, proving up on same. Mr. Strong is one of the younger old settlers of Valley county, and has had much to do with the building up of same. He now lives on a forty-acre tract in section twenty-two, township nineteen, range thirteen, where he has a fine, well-improved farm, including one hundred and sixty acres nearby in section twenty-one, and is engaged in farming and stock-raising. He is a carpenter by trade, and followed that vocation from 1895 until 1910, the sons being large enough to run the farm. Mr. Strong built most of the large barns and fine dwellings in this part of the valley during the years he was a builder. He is a self-made man, having supported himself since his twelfth year, with the usual varied western experience. On April 16, 1884, Mr. Strong was married to Miss Florence D. Drake, in Ord, Nebraska, Miss Drake, a daughter of James T. and Susanna (Sargent) Drake, is a native of New York state, and comes of an old Valley county family. Mr. and Mrs. Strong have three children: Marion, Guy M., and Hazel Blanche. They are a family having the respect and esteem of many friends and acquaintances. During his first years in Nebraska Mr. Strong rented land in Hamilton county, where he raised corn and broke his own land and seeded to wheat, hauling his grain to Grand Island, over sixty miles distant. Part of the time he freighted between Grand Island and Central City into the Loup country. There were a few deer in Valley county at that time, and a few elk in Hamilton. At one time, while living on his homestead, a drove of over three thousand Texas cattle trailing across the country to the Sioux reservation, were herded near him in the valley of Noble township. Mr. Strong has in past years been closely identified with the growth and development of Valley county, and has served the people creditably as township assessor. He is a member of the Methodist church, and affiliates with the Odd Fellows and the United Workmen. He is independent in politics. We show a sketch of Mr. Strong's original sod house on his homestead in contrast with his present commodious home and farm buildings, all of which are of his own construction. "Spring View Stock Farm," Residence of David E. Strong. Eugene A. Kinkaid, one of the best known pioneers of Pierce county, Nebraska, is a prosperous agriculturist of the southwest quarter of section fourteen, township twenty-six, range four, where he has spent the past thirty-eight years of his life. He has followed farming nearly all his life, and despite many discouragements during his early residence in this section, has acquired a thoroughly improved farm of four hundred and eighty acres and become one of the well-to-do men of this locality. Mr. Kinkaid was born July 12, 1860, in Scott county, Iowa, and is a son of Skiles W. and Mary (Mooney) Kinkaid, both natives of Pennsylvania, who were married in Davenport, Iowa, in 1857. Our subject's father came to Iowa in the early forties, and enlisted in Company A, Fourteenth Regiment Iowa Volunteer Infantry, in 1861, serving in the army of the west. In 1868, Mr. Kinkaid with his parents moved from Scott county, Iowa, to Freeborn county, Minnesota, where they lived about four years near Albert Lea, and in 1872 came by ox team to Pierce county, Nebraska, where the father homesteaded land in section twenty-two, township twenty-six, range four. Here the family experienced their full share of hardships and inconveniences common to those early days, the nearest railroad market place being at Wisner, the end of the railroad, sixty miles away. They lost their entire crops in the grasshopper raids of 1873, 1874 and 1875, and at the time of the blizzard of April 12, 13 and 14, 1873, they were building a house, which was partly completed at the time; the frame was up but the roof was not on, and their only shelter was canvas nailed on the studding. The storm was so bad they could not get out from under the canvas for three days, and they were almost frozen. A storm in the fall drove their cattle to the Elkhorn river, where nearly all perished. When searching for them the father found a vacant house, which he rented for the winter, and during that time cut trees and made lumber to finish the house they had started. The family had come back to their claim but a few weeks before this severe storm, and were illy prepared to withstand it. They had a serious time fighting prairie fires in the early days, a constant menace to their buildings and crops. For several years hay was their only fuel. Elk, deer and antelope were plentiful then, and also a few buffalo were to be seen from time to time. On October 4, 1888, Mr. Kinkaid was united in matrimony to Miss Blanche Wetherby, a native of Whiteside county, Illinois, daughter of Lafayette and Elizabeth (Hatheway) Wetherby. To Mr. and Mrs. Kinkaid four children have been born: Alice, Ethel, Carroll and Mattie. dred and sixty acres in section twenty-two, and another quarter section in section fifteen, making four hundred and eighty acres in all. Mr. Kinkaid is a member of the Methodist Episcopal church, is affiliated with the Ancient Order of United Workmen, and votes the republican ticket. In the gentleman above mentioned we have one of the worthy citizens of Howard county, Nebraska, who for many years past has been active in all affairs of local benefit, aiding in the establishment and building up of the schools, furthering the commercial and farming interests of his section, etc. He is well known as a successful farmer and stockman. He resides on section twenty-eight, of Warsaw precinct, which is his original homestead taken in the pioneer days; and this he has improved in such shape that he has one of the best equipped estates in the region. Niels J. Steffensen is a native of Denmark, born on August 20, 1847, and is the second child in the family of Steffen and Mary Nielson, who were the parents of four. The father died in Denmark, and the mother is still living there at the age of eighty-nine years, and is still in good health. Niels came to America in the spring of 1873, locating in Howard county, where he settled on a tract of land and begun to develop a farm. He met with many discouragements during the first few years, going through all the hardships incident to pioneer life on the frontier, but gradually succeeded in raising good crops and adding improvements to his place. He engaged to quite an extent in the stock raising business, getting together quite a herd of cattle, and during later years has acquired considerable land in Howard county, besides some in Sherman county. He is progressive and up-to-date in his methods of farming, and every part of his estate bespeaks thrift and good management. Mr. Steffensen was married in Denmark in 1871, to Katrina Petersen, who came to America with him and passed through the same experiences as her husband, and to her faithful help is due in a great measure his success. They have a family of eight children, namely: Jens P., Mary, Soren, Emma, Annie, Stenie, Elsie, and Sarah, all married and settled in comfortable homes with the exception of Soren, who lives with his parents on the homestead. The family is greatly respected throughout their vicinity, and have a wide acquaintance. David P. Scott is a member of a family that has long been prominent in Custer county, and he has been closely identified with the best interests of Ansley, of which city he has been serving as marshal since 1905. He is also city water commissioner and is one of the best known men in the community. He has a comfortable home in Ansley and enjoys the respect of a large circle of friends and acquaintances. Mr. Scott was born in Scotland, January 2, 1859, second of the five children of George and Margaret (Purvis) Scott, also natives of that country. The family is given more extensine [sic] mention in connection with the sketch of John Scott, which may be found in this work. The father came to America in 1867 and David Scott grew to manhood in Wisconsin, where he then engaged in farming on his own account. In 1868 he went to Colorado and pre-empted one hundred and sixty acres of land near Holyoke, remaining there three years, following which he worked some years for the Denver Union Water Works Company. On June 5, 1895, Mr. Scott was married at the Garniss home in Custer county, to Miss Harriet Garniss, a native of Canada, who came to Nebraska with her parents in an early day. They came first to Howard county and later to Custer county. The family is mentioned at considerable length in connection with the sketch of John Garniss, to be found in this work. In 1898 Mr. Scott and his wife, with their two children, came to Custer county and spent three years on a farm there, then lived three years in Troy, Idaho, where Mr. Scott did teaming. In 1904 they came back to Nebraska and since that time they have lived in Ansley. Five children have been born to them, viz. : Gladys E., Hazel J., Henry P., George T., and Belva H., all at home. Mr. Scott is favorably regarded as a useful, enterprising citizen, and he and his wife are well-known in Custer county, where both have spent much of their lives. Mr. Scott is affiliated with Modern Woodmen of America, and is also a member of the Knights of Pythias. Mrs. Scott is a member of the Royal Neighbors of America. E. T. McGehee, of Madison county, Nebraska, has, by dint of general Industry, reliable character and straightforward business methods, built up for himself a name and standing second to none in this part of Nebraska. He is still in the maturity of his powers, and commands a host of friends wherever he is known. Mr. McGehee is one of the very oldest settlers in this region, having come here to reside some forty-nine years ago; he now lives in section six, township twenty-one, range one, where he and his family are loved and respected by all. Mr. McGehee is a native of Iowa county, Wisconsin, born April 8, 1850, and is a son of Henderson and Sarah McGehee, both natives of Tennessee. of Madison City, and after locating on the homestead, built a dug-out and lived in this five years; he then built a frame house, hauling the lumber for this house from Columbus, many miles distant. Deer and antelope were plentiful in those days, and occasionally a few elk were to be seen; in 1873, 1874, and 1875, the grasshoppers destroyed all the crops, which made it very hard sailing for the early settler. In 1893 Mr. McGehee bought the Adair and Martin homestead, his present farm, which he improved, and where he now has a beautiful home. While living on this farm, in 1894, he lost all his crops by the hot winds that prevailed during that season. Mr. McGehee now owns about thirteen hundred and seven acres of tine land, all of which is well improved. In 1876 Mr. McGehee was united in marriage to Miss Bessie Leach, and Mr. and Mrs. McGehee are the parents of seven children, whose names are as follows: Ralph, Edna, Florence, Ruth, Aria, Mary, and Elberta. They are a prominent family, and, as before stated, are highly respected and esteemed by all who know them, and their friends are many. Judge John S. Benjamin is one of the oldest settlers of Custer county and one of the best known citizens in his part of Nebraska, where his name stands for progress. He is honored and respected as a veteran of the civil war, and has a wide circle of personal friends. He was born in Ithaca, New York, March 15, 1839, being fourth in a family of six children and a son of Selah T. and Mary (Townley) Benjamin, natives of New York, where both died, he in 1876 and she in 1853. Several of their children are deceased and besides Judge Benjamin, the only other one now surviving is Harrison H., of Ithaca. Judge Benjamin grew to manhood in his native state and there received his education, later learning the trade of cigar-maker. On September 10, 1861, he enlisted from Ithaca in Company E, Sixty-fourth New York volunteer infantry, serving until the close of the war. He was discharged at Elmira in May, 1865, having participated in the following important engagements: Gettysburg, Antietam, Spottsylvania Court House, Fredericksburg, Wilderness, Fair Oaks, Peach Orchard, Malvern Hill, White Oak Swamp, Chancellorsville, second Bull Run and Petersburg, Virginia. He was wounded at Fredericksburg, and at Petersburg was taken prisoner and held in Andersonville prison ten months. He held the rank of second lieutenant, and later that of first lieutenant, and finally that of captain of his company. He won a good record for faithful service and after the close of the war returned to New York, and there engaged in the cigar business on his own account, which he continued until 1868 In that year he removed to Marshall, Michigan, and there on March 12, 1874, he was united in marriage with Delia Murphy, a native of Michigan, and daughter of Michael and Ann (Calhoun) Murphy, her father born in Cork, Ireland, and her mother in St. John's, New Brunswick. Both parents died in Marshall, Michigan, the father in 1869, and the mother in 1862. One daughter lives in Battle Creek, Michigan, and a son in Indianapolis, Indiana. In December, 1881, Mr. Benjamin brought his wife and two children to Grand Island, Nebraska, and in the following March they came to a homestead of one hundred and sixty acres of land on section twenty-nine, township seventeen, range twenty, adjoining the city limits of Broken Bow. This has since then been the home place, and for many years the family occupied a sod house that was characteristic of the time and locality. In 1883 he was appointed county judge and served about a year and a half, after which he was elected to the office and held it a number of years. He was for some time Commander of Washburn Post, G. A. R., of Broken Bow. He and his wife have witnessed the steady growth of Broken Bow from the time it consisted of one house and the postoffice and have done their share towards forwarding its development and welfare. Judge and Mrs. Benjamin have two children, Eva, wife of Harry Townley, of Ravenna, Nebraska, and John S., Jr., who is now in the theatrical profession. The latter enlisted in 1898 as musician in Company M, First Nebraska volunteer infantry, for service in the Spanish-American war, and soon afterward entered active service, participating in the capture of Manila. He received his discharge at San Francisco. [J]udge Benjamin is a member of the Knights of Pythias. It would be impossible to tell the history of northeastern Nebraska without mentioning the name of Daniel McManigal, so closely has his life been interwoven with the life of that section. For many years he has been a resident of Wayne county, and before that time, had been prominent among the first settlers of this part of the state. His deep interest in public affairs was evinced when he served his country during the Civil war. He was a brave and loyal soldier, and has proven himself a true, public-spirited citizen. He is one of the most successful farmers of the locality, and is the proprietor of five hundred and sixty acres of fine land. Mr. McManigal was born in Ohio, November 14, 1832, his father and mother, James and Lovina (Wilds) McManigal, both having come from the old country some years previous. The father was born in Ireland, and the mother in Scotland. The childhood and youth of our subscriber was spent in Ohio, where he obtained his education.